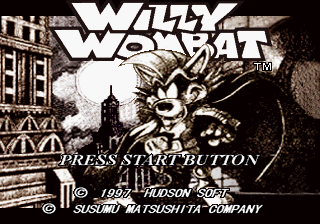 Willy Wombat (ウィリーウォンバット) is a top-down action game for the Sega Saturn. Willy Wombat's existence forced development team, Naughty Dog, to change the name of their title character to "Crash Bandicoot", but whereas Crash Bandicoot and its sequels were a massive success for the Sony PlayStation during the mid-to-late 90s, Willy Wombat saw a much more muted response, remaining exclusive to Japanese Saturns. WILLYWOMBAT Opening Theme: "Here To Stay"
WILLYWOMBAT Ending Theme: "Fearless Heart"
Main article: Willy Wombat/Magazine articles.